Deserts may not be the first places that come to mind when planning a camping trip, but they just might be after reading this article. Deserts can be foreboding, conjuring images of parched men searching for water under a high and hot sun. The survival instincts that are genetically written into our beings tell us to be wary of them, to stay away, to not venture too far from the office water cooler, literally and figuratively. But if that were all it took to keep you from the road less traveled, you wouldn’t be reading this. No, it’s going to take more than that, for you are smitten with wanderlust, saddled with curiosity, and designed for a walkabout. You are an explorer, an adventurer, a legend in the making and desert camping is just another notch on the handle of your Bowie knife. Well lucky for you desert camping has a lot to offer like enchanting scenery, amazing geology, and storybook sunrises. Desert camping will capture your heart with unique wildlife like Roadrunners and Gila Monsters (don’t worry their not really monsters) and Saguaro Cacti towering like green giants and the Red Mariposa-Lily (deep orange and yellow-orange flowers that only bloom if the temperature is just right and the rainfall is just so). Then there is the night sky, unrivaled for star gazing through clear cloudless nights into the infinite unknown of the cosmos, where the only limits are your imagination. And the weather, let us not forget about the weather. Dry, hot days kissed by the sun under endless blue skies and cool nights that caress you into slumber. And for the history lovers, how about abandoned mining camps where fortunes in gold were dreamed of and forgotten ghost towns where history favored the quickest draw and the straightest aim. Desert camping has something for all of us and gives us that something like no other terrain could. Here at Campers & Gear, we believe our purpose is to inspire you to explore the natural world, to endeavor to have experiences which cannot be taken for granted, and to live outdoors. We live by our mission, to insure that you set out fully prepared with vital knowledge, important skills, and the ability to make the best gear decisions, so that whether you are boondocking off the grid or enjoying an amazing campground, you will always be living life to the highest level of excitement. Preparedness is the cornerstone of any adventure and desert camping poses singular challenges. Deserts can be very hot making water extremely vital. In very hot conditions you need to stay hydrated, making it important that you pack enough water, and know how to find drinkable water in the wild should an emergency arise. The dramatic swings in temperature from day to night produce condensation which can be captured in the early hours. The desert sun can be extreme. Protective clothing that is light and loose with room between the clothing and body is best. Pants protect the legs better than shorts. Layering is the best practice to handle the temperature swings. A hat that covers your face and neck along with sunscreen and sunglasses will keep you safe during the brightest days. Deserts are arid and dry by definition, but rain can come and when it does it can be torrential, causing flash flooding and washed out roads. Set up camp away from dry river beds and out of canyons which can fill up rapidly with dangerously fast moving water. Set up camp in the cooler evening hours and make the necessary preparations for building the perfect campfire to keep you warm during the cold of the desert night and for cooking and boiling water. Deserts are mostly barren, so bring the appropriate amount of fuel for your stay. Sandstorms and dust storms are also known as Haboobs can come upon you without warning, reducing visibility and sending gritty sand particulates into just about every exposed area. In the event that a Haboob finds you, take shelter if possible, close all entrances, hatches, and windows. If you are unable to take shelter, stop where you are as traveling in a lack of visibility could result in injury. Protect your eyes, mouth, ears, and nose. Don’t sleep directly on the ground; it is better to have airflow between you and the hot earth. Air can circulate under a raised bed. High protein foods increase metabolic heat and water loss. If you are rationing water, eat less food. Wild food sources are scarce, so go prepared with freeze dried meals (if water allows) and food that won’t spoil in the heat. Don’t walk barefoot. The ground can be extremely hot. Most health concerns in the desert come from exposure to sun or dehydration. Keep covered, utilize shade, and stay hydrated. If washing up is limited for water rationing reasons, focus on crevice areas like armpits, groin, and between your toes. Packing baby wipes can come in very handy for this purpose. Avoid thorns, insect bites, and beware of picking up rocks and other landscape features where spiders, scorpions, or snakes may dwell. Now you know to bring layered clothing options, water, food, and fuel, so now check out this handy gear list to know what else to bring. 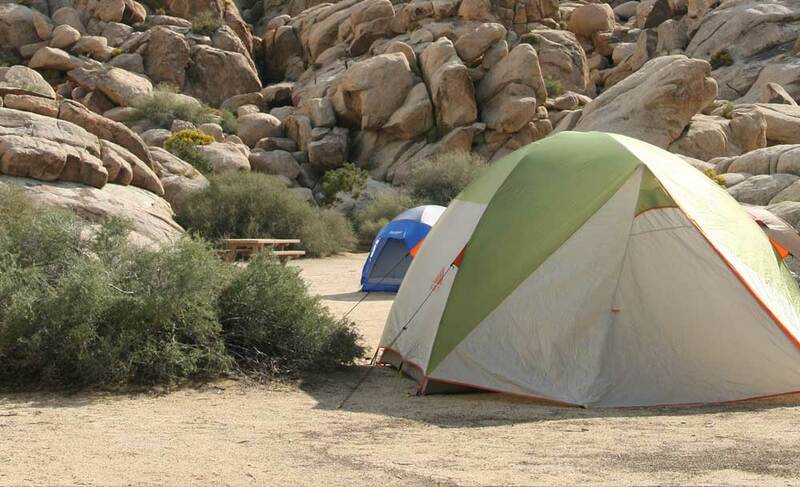 There are many amazing desert camping locations to take advantage of right here in the United States. The meeting of two unique ecosystems the Mojave and the Colorado join up in Joshua Tree National Park. Known for the park’s namesake the cartoonish, twisted, and spikey Joshua Trees as well as a wide variety of desert flowers, plants, and animals along with important cultural history, dark starry skies, and otherworldly geologic features, make Joshua Tree a must have notch on that Bowie Knife.This expansive wilderness in southern California offers nature and hiking trails, birding, and wildflower viewing, rock climbing, and stargazing. Looking for more, how about mountain biking, horseback riding, or a geology motor tour?Most campgrounds are first come first served with reservations accepted at Black Rock and Indian Cove during the high season between October and May. Book online at www.recreation.gov or by telephone at 877-444-6777. It is recommended that you bring water with you. If you are RV camping, know that there are no hookups at any campground in Joshua Tree, but there are dump stations and RV accessible potable water at Black Rock and Cottonwood. RVs and travel trailers cannot exceed a combined maximum length of 25 feet at Hidden Valley and White Tank campgrounds. With over 2 million visitors a year, Quartzite, Arizona is reputed to be the RV boondocking capital of the world. During the town’s two-month long gem show and swap meet in January and February, amateur geologists and curious enthusiasts make the pilgrimage to Quartzite in record numbers for the rocks, gems, minerals, and fossils.The Sonoran desert setting is situated just 125 miles west of Phoenix and only 18 miles away from the Colorado River. It is a top destination for those seeking immaculate desert views with surrounding mountains, beautiful scenery, and noteworthy sunsets. Not to mention the massive boondocking phenomenon that is unlike anything else.So load up your RV and head out to the “Rock Capital of the World” and enjoy the Saintliness of Boondocking! This annual gathering on BLM land in Black Rock City a temporary community in the Black Rock Desert in Nevada, is unlike any other camping experience. One only needs to look at aerial photos of the event to see the grand scale and be amazed by the sincerity of its participants to follow camping law number 1. Leave No Trace Behind.It Takes place over the Labor Day weekend and focuses on art, creative expression, music, and even “mutant cars”. Its participants are highly encouraged to participate in some form of creative expression and sense of community.A truly non-traditional and one of a kind desert camping experience of a lifetime. With backcountry hikes never before open to the public like the Red Basin and Martha’s Butte, the Petrified Forest National Park has never offered more than it does now. Known for petrified wood and wildflowers this treasure of the National Park system is truly distinct from other places.Backcountry camping permits are required for overnight stays in the wilderness areas. Permits are free but must be acquired in person at the Painted Desert Visitor Center, Painted Desert Inn, or Rainbow Forest Museum at least an hour before the park closes.With things to do like driving or pedaling through the park, hiking and backpacking the trails, horseback riding, geocaching, and marveling at the petrified logs, you will surely remember camping at the Petrified Forest National Park. As you can see, desert camping has a lot to offer from scenic beauty and otherworldly plants, animals, and geologic formations. You can find solitude or join the masses for gem shows and festivals. You can take your RV or backpack into the wilderness, whatever the case, we’re sure you will have a sweet time of it.